one × one = Required Please enter the correct value. It's playing out much like the Wall Street stock market crash of 1929. In case you've been distracted by such things as the Greek debt crisis and a bizarre glitch that shut down the New York Stock Exchange for more than three hours Wednesday, the Chinese stock market has been in a free fall lately. Although it rebounded 5.8% today (Thursday) thanks to more government intervention, the Shanghai Composite Index has shed 29% over the past month. An equivalent loss for the Dow Jones Industrial Average would be a drop of more than 5,100. Paper losses already exceed $3.25 trillion. This follows a dramatic run-up of 150% in the 12 months leading up to mid-June. That's disturbing enough, given how interdependent the global economy is today. 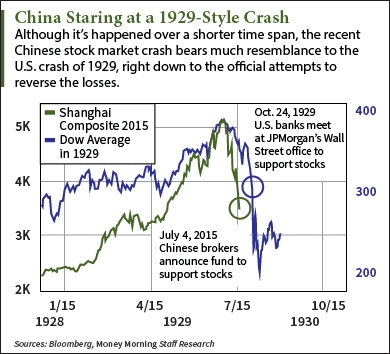 But the similarities of the China stock market crash to the Crash of 1929 make it particularly troubling. Both have prominently featured failed interventions. Back in 1929, it was the big bankers of Wall Street that tried to stop the bleeding. The top names of the day – Morgan Bank, Chase National Bank, and National City Bank – pooled their resources and tried to prop up the market by buying shares of blue-chip stocks such as United States Steel Corp. (NYSE: X). But the strategy could not overcome the wave of selling, which eventually dropped the DJIA 89% from its peak. These drastic measures have succeeded in only briefly reversing the China stock market crash. I don't believe China's problems will spill over into the U.S. and cause another 2008 financial crisis, at this time. We are not concerned about it and except for companies like Apple that do lots of business over in Asia, still insulated. Only 45% of U.S. Households even have any mutual funds or stocks themselves. Those that do are mostly tied-up in IRA's and 401 (K) investments and are largely illiquid. Mom and Pop investors stayed home after 2008-2009, but some bought bonds and bond funds. Rising interest rates are a bigger market concern in the U.S. due to all the debt we have piled-up in the last 10 years. The '29 crisis in the US caused a recession in Europe, due to excessive global financial linkage. (2) a crash in industrial finance within China could cause production supply chain bottlenecks and cause supply-shock inflation in the US (which imports most of its goods from China). Unlike demand-side inflation, supply-shock inflation causes stagflation. What if they demand payment for borrowed money?